These Chile Lime Macadamia Nuts make snacking healthy an easy choice. The suitcases are all unpacked now. Snorkeling gear put away. Laundry under control. Homework routine reinstated. Sand that snuck into our bags and found it’s way on our tile floors has also been vacuumed up. Yes, vacation is done, and we are back on cruise control with our home routine. Thanks to Costco, we were able to buy bulk-sized souvenirs with big gift packs of macadamia nuts and chocolates. Even those have been passed out to friends and family, too. The kids really enjoyed snacking on the macadamia nuts while we were in Hawaii, so some of those cans are staying home with us. 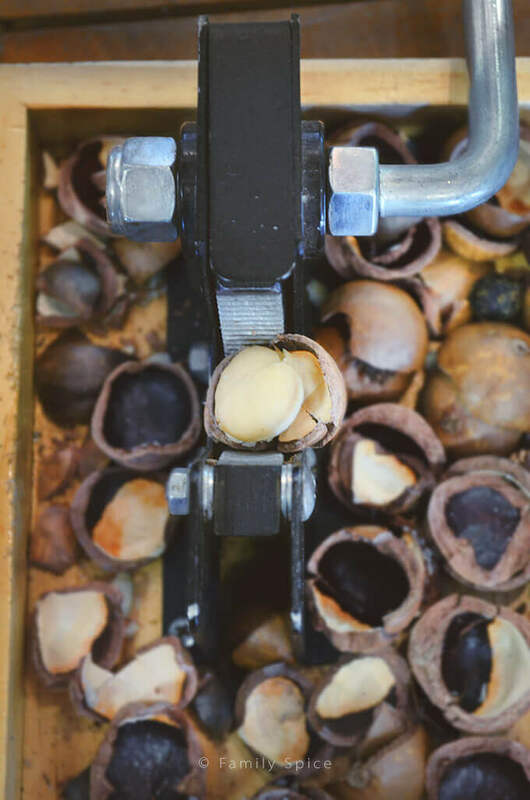 One of our favorite stops on the big island was a trip to the Hamakua Macadamia Nut Factory, in the northern town of Kawaihae. I was expecting a factory and nut farm, but was sad to see that the farms were located all over the island, but not here. Luckily, I wasn’t disappointed for long. Neither were the kids. 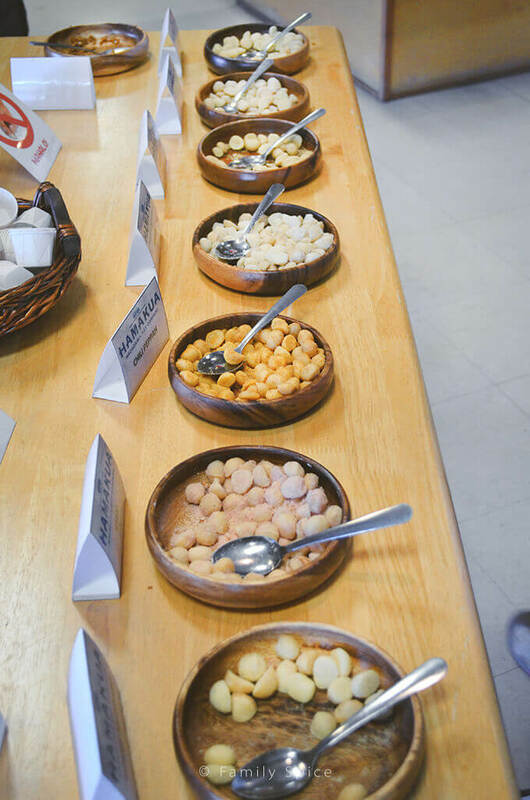 We were able to sample 7 different flavors of macadamia nuts, as well as their flavored popcorn, chocolates and other goodies. 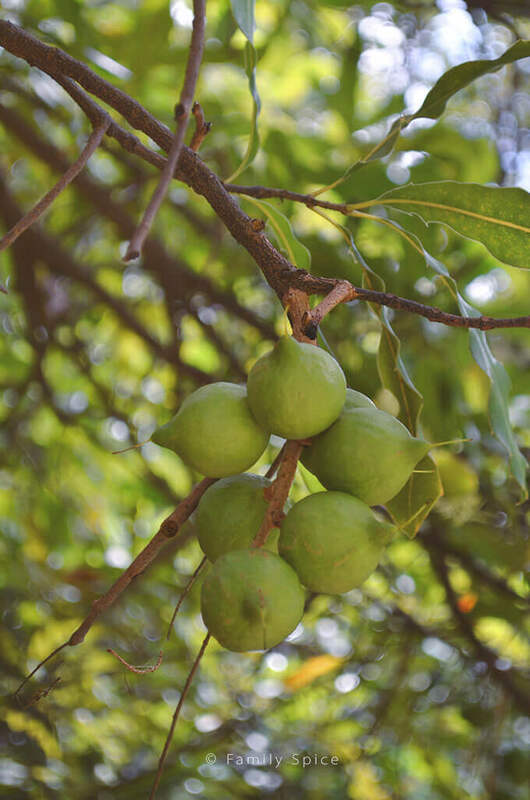 What makes Hamakua Nuts stand out is their stance on being eco-friendly. They do not use fungicides or insecticides on their farms. They also do not use fossil fuels to dry out their nuts – they burn the nut shells for energy. From Spam to Wasabi, they’ve got a flavor for you. I forgot to warn the kids what wasabi was, but luckily for them, water was close at hand. I loved the Chile Pepah nuts so much that I mixed my own chile-lime spice mix when I got home. We also brought home some macadamia nut brittle and of course, chocolate covered mac nuts to share. 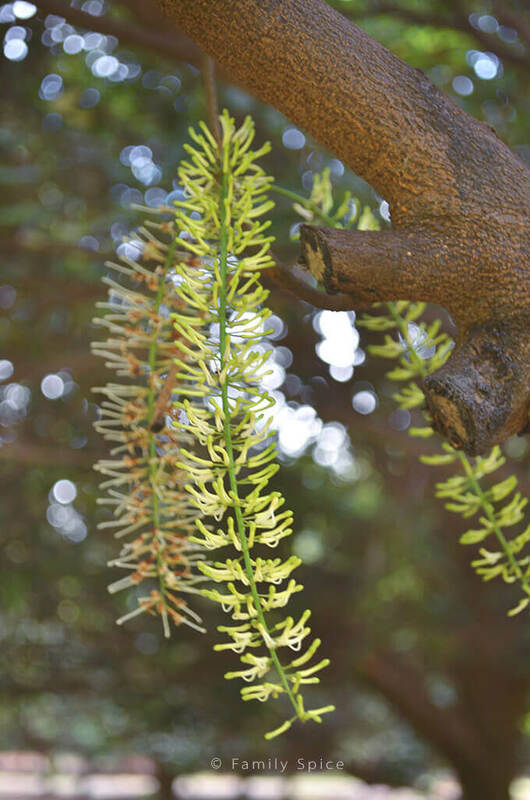 You will also find macadamia oil, lotions and other macadamia products here. My kids thoroughly enjoyed cracking open the macadamia nuts on hand – those suckers really are ONE TOUGH NUT. 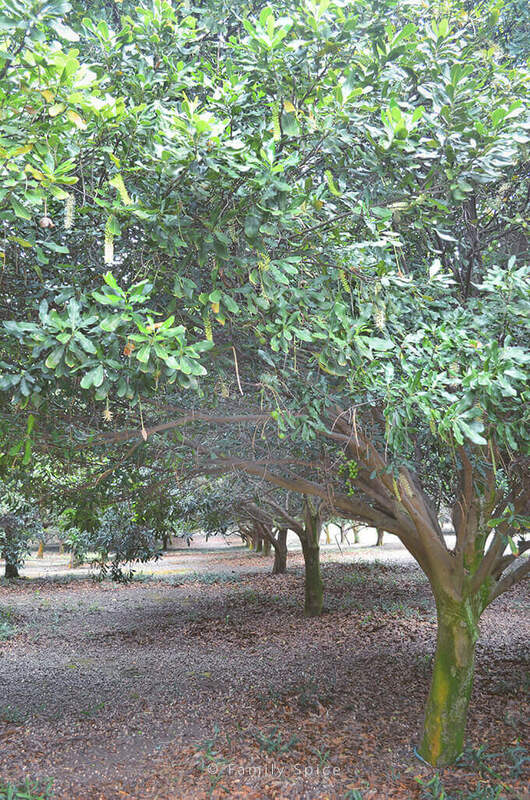 You can find macadamia nut trees all over the island. The hubby drove by a farm and pulled over so I could snap shots of these blooms and nuts on the trees. It wasn’t quite the right season to enjoy a grove filled with mac nuts, but I happily got my farm-fix in. 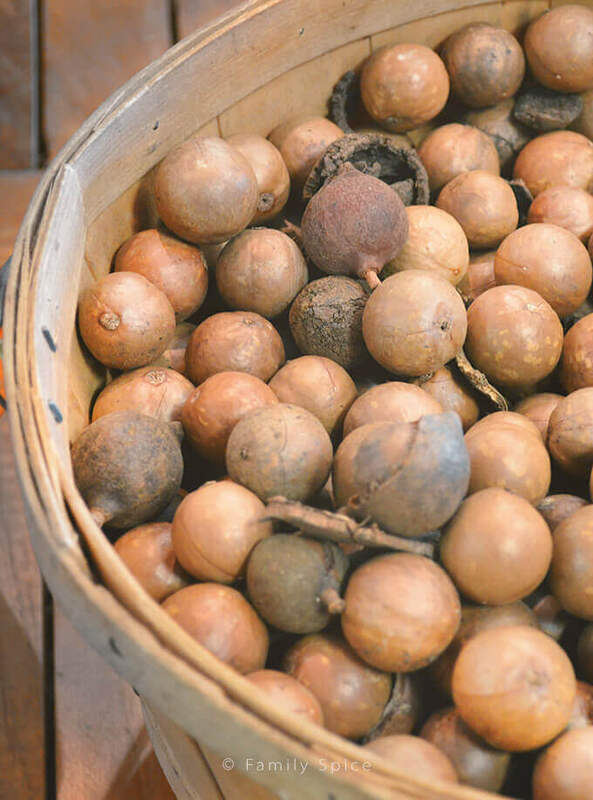 Macadamia nuts, like all nuts, have many great health benefits. Although mac nuts are high in fat, most of it is monounsaturated “good” fat that lowers your “bad” LDL cholesterol and raises your “good” HDL cholesterol. They are high in fiber, protein, thiamine, vitamin E, riboflavin, omega-3, niacin and iron. 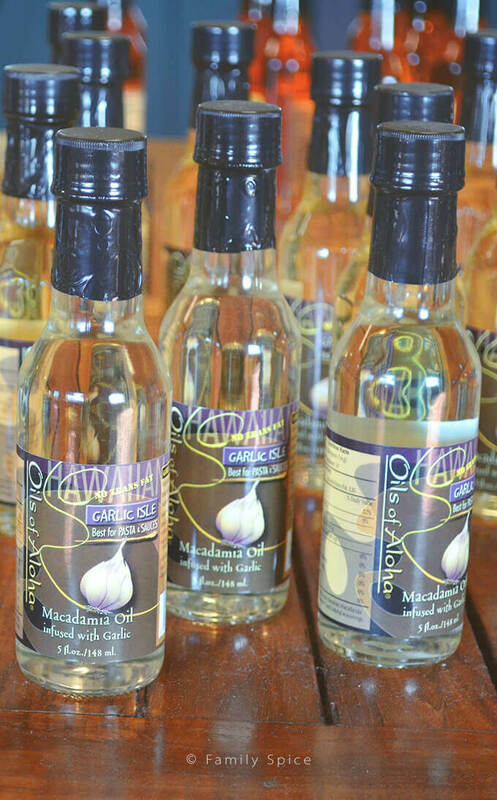 Macadamia Nut oil has a high smoking point, so it is great on the grill. Learn more about oils and smoking points here. 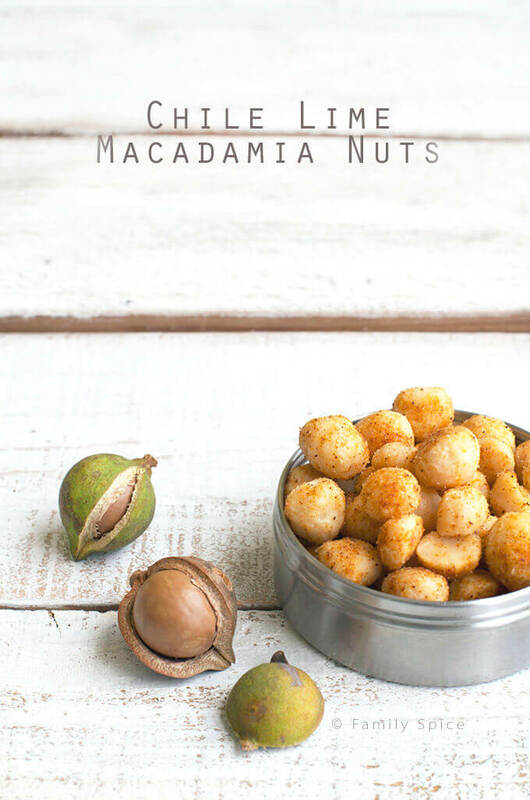 Read more about the health benefits of macadamia nuts here. Preheat oven or toaster oven to 350ºF. Roast nuts in the oven for 3-5 minutes. Do not burn! Season nuts with spice mix, shaking them in the pan to coat evenly. Disclosure: I was not compensated in any way to write this post. I paid for these nuts with my own money. This is just an honest review of my experience. I love macadamia nuts! Now I’m dreaming of chile and lime…yum! The best nut on the planet, I think – love what you did with them – chile and lime sound yummy. I love macadamia nuts! How fun to see (and eat!) them at the source. Love the idea of a chile and lime seasoning, although the citrus acid powder is new to me – I’ll have to look for that! Good stuff – thanks.